Simply login with your github account. No need to create another account and remember another password. 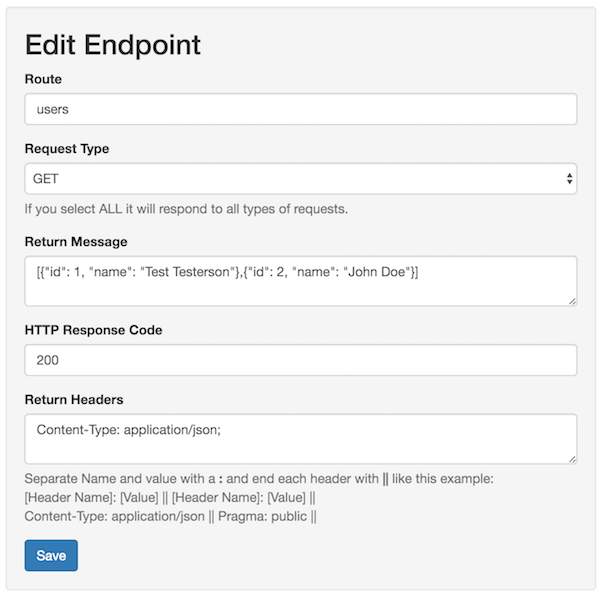 Create an endpoint by simply entering in a route, request type, return message, http return code and optional headers. Generate a new API token to use with your requests to private endpoints. Currently tokens are good for 12 hours. I'm sure many of you have heard of Postman before, if not go check it out it is an awesome tool. Postman is designed to help you make requests to web servers and control what gets sent in without having to actually create an HTML page or create Curl requests. If you have ever created an API I'm sure you lived in Postman as it is one of the easiest ways to generate requests. So while Postman is great for simulating requests, what if you are working on the other side of a project? If you are writing a Single Page Application and you are going to be using a RESTful API but it is still being built how can you test your frontend code? Or even if you are working on backend code and just need to mock out a request to another API, how can you test this without actually setting up your own server? These are the types of situations that TestApi.io was created for. We know there are other tools out there like Apiary and Swagger and even recommend them, however they can either cost money or can be somewhat complex to setup and host somewhere. So TestApi.io was created so you can quickly setup endpoints in a few seconds and keep working on your code. TestApi.io was created by developers who at many times wish they had an easy way to setup a mock api. We got sick and tired of constantly setting up a simple application just to mock out these requests so we created a simple tool to do this for us. Currently TestApi.io is completely free the only limitation is api tokens are only good for 12 hours. We may increase this in the future depending on usage. Hope this simple tool helps you out! Fixed problem with endpoints that had unescaped html in return. Clicking on token or endpoint url box selects the text to make it easier to copy and paste. Added a small link next to endpoint box to open endpoint in a new tab. Updated some styling inside the application to match the landing page style. Added a new editor for the return response. Allows for code view, json tree view, and a regular text view. This should make it easier if you are trying to construct valid JSON. Endpoints can now be marked as public or private. Public endpoints do not require that a token be sent with the request. Response codes are now a drop down of valid response codes with a short description. Some other behind the scenes upgrades to try to improve overall performance.